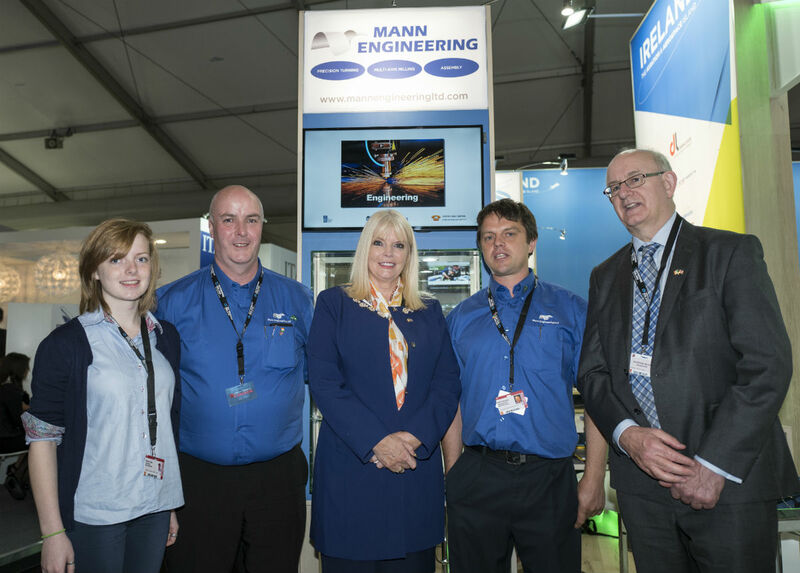 On Day 3 of the Farnborough International Airshow, New Minister for Jobs, Enterprise and Innovation, Mary Mitchell O’Connor visited the Mann Engineering stand on the Irish Pavillion. The Ministerial reception event, which was seen as one of the highlights of the Farnborough Air show was attended by over 200 people and it allowed for the six Irish companies to network and promote their goods and services directly to potential clients. There are over 250 companies active in the aviation and aerospace sector in Ireland contributing over €4.1 billion to GDP and supporting 42,000 jobs in Ireland. The majority of these companies are involved in Leasing and MRO. Ireland is responsible for leasing over 50% of the worlds aircraft. Companies such as Mann Engineering is an emerging precision machining company entering the Aerospace supply chain network, a worldwide market worth over $5.2 trillion. At present both Boeing and Airbus as nearly 10 years behind on their build schedules, mainly due to the supply chain not being able to keep up. At present Boeing produce over 33 finished aircraft per month and Airbus over 50 per month.To give an indication of the type of figures involved Airbus announced at the show that they had sold 279 aircraft totalling €31.6 billion. One of these orders was from Virgin Atlantic president Sir Richard Branson, who visited the air show to announce a €3.97 billion order for 12 Airbus A350-1000 aircraft. As well as this Boeing announced that they had secured orders for 182 commercial aircraft totalling €24.2 billion.